Dubai: Twenty-five per cent of the UAE’s needs will be supplied by clean nuclear energy when the first nuclear plant will be launched in 2017, General Shaikh Mohammad Bin Zayed Al Nahyan, Crown Prince of Abu Dhabi and Deputy Supreme Commander of the UAE Armed Forces, announced. Shaikh Mohammad made the announcement at the Government Summit’s main plenary session on Monday. The third Government Summit, being held under the patronage of His Highness Shaikh Mohammad Bin Rashid Al Maktoum, Vice-President and Prime Minister of the UAE and Ruler of Dubai, at the Madinat Jumeirah from February 9 to 11, is being attended by heads of state, high-ranking government officials, technology experts and educationists from around the world. Shaikh Mohammad said that 50 years from now, there may be no more oil reserves to depend on, which is why the UAE government has started to focus on alternative resources to further build its economic strength. “Today, under the leadership of Shaikh Khalifa, our economy is strong and flourishing. Shaikh Khalifa is directing us to focus on education, health, innovation, economic diversity and security. Shaikh Mohammad admitted that the UAE was late in focusing on education. “However, knowing that you are late and working on it is what matters,” he said. Shaikh Mohammad said there is no doubt that there are a lot of challenges in education and to overcome these challenges, there has to be a clear vision. The outcome of education for the next 20 years, he said, must be known from now. “With the leadership of Khalifa, we established the Abu Dhabi Investment Authority (ADIA) in the ’70s, which today is considered the second-biggest sovereign investment fund in the world. He acknowledged Ahmad Khalifa Al Suwaidi and Mohammad Habroush for their role in the founding of ADIA. Shaikh Mohammad said the country has also started advancing in the manufacturing industry. “Srata Manufacturing in Abu Dhabi manufactures parts of Boeing and Airbus planes. If that is not impressive enough, 83 per cent of the workforce are women,” he added. Shaikh Mohammad also congratulated Shaikh Mohammad Bin Rashid Al Maktoum for building Dubai International Airport, one of the biggest international airports in the world, where the number of travellers reached 70 million. Shaikh Mohammad acknowledged that oil prices were at a low now, but people forget that in 2008, they were even lower but “the ship continued sailing”, he said. 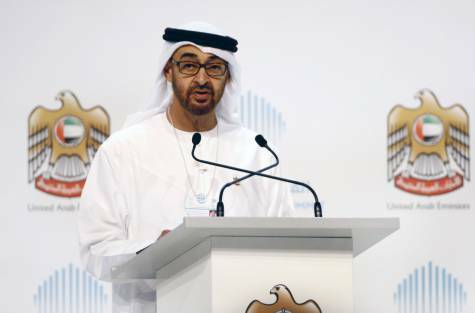 The UAE has been trying to do so through its humanitarian work, not only by the country’s government but also by its people, he said. The journalist, said Shaikh Mohammad, did not know that Shaikh Zayed’s ‘children’ will pay back their country. He provided examples: “In the ’90s, during the war on Kuwait, we asked people to volunteer for the military. We expected 40,000-50,000, but we received around 80,000. We also asked for 4,000 cars from our merchants. One of them, Abdullah Al Masoud, refused to take any monetary compensation. He said he wanted to perform his duty towards his country. During the session, Shaikh Mohammad displayed pictures of some youth who volunteered for the military service. He said he got this sample of youth because they volunteered even though they were exempted from service due to health reasons or due to the fact that they were the only men in the family. Shaikh Mohammad concluded by thanking the families of these volunteers who had instilled in their children the value of loving their country.